With temperatures nearing triple digits and the 4th of July just three weeks away, Marie Claire Creative Director and JCPenney’s Style Voice, Nina Garcia shares how you can travel like a jetsetter this summer. Take the worry off on what to pack. 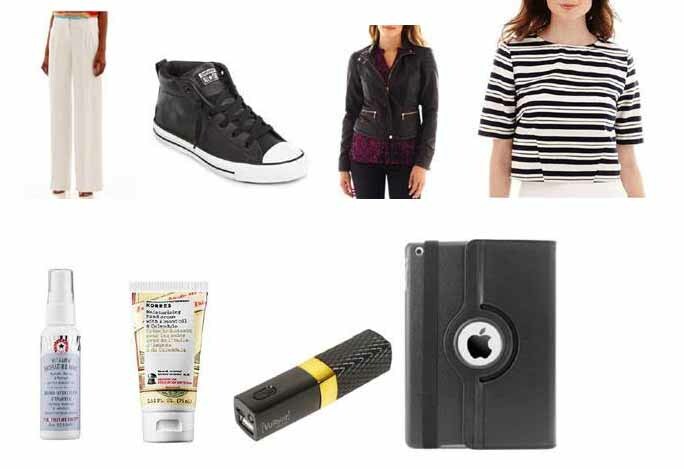 Nina has hand selected the beauty and fashion travel items you need before taking off! Nina understands that the most important thing when selecting what to wear for travel is being comfortable yet stylish – so she recommends a flowing, wide legged pant like the Worthington Wide-Leg Soft Pants below. Another important item we ladies look for when traveling is a comfortable, yet stylish shoe. She selected the Converse Chuck Taylor All Star Street Sneakers below for the perfect combination of street and chic. You also want to be sure to have a cool tee and matching jacket to layer on for the flight for which Garcia recommends the Stylus Short-Sleeve Striped Boxy Top and a.n.a. Faux-Leather Moto Jacket as seen below. All of the fashion items are available at JCPenney for under $100 so you can save money on your wardrobe and spend more on your trip! When traveling, it’s not only important to have your outfit looking fresh but your skin as well! Nina loves the Vitamin Hydrating Mist and Korres Moisturising Hand Cream available at Sephora for refreshing and reviving your skin while jet setting. Lastly, make sure you have your travel tech game locked down with a Lip Stick Style Portable Charger to make sure your cell phone never gets low and a Rotating iPad Case to watch all of your favorite movies on!